Can anyone identify this weed? The leaves of three & flowers are about 1/4 the size of clover. My yard is covered in the stuff. purslane. It is an edible weed, tasty and very nutritious. It is very low in calories and fat, but high in omega-3's, fiber, Vitamin A, Vitamin C, some B complex vitamins, and anti-oxidants. Eat your weeds! If it's the yellow flowered one, I think it's black medic? rainbowgardener wrote: purslane. It is an edible weed, tasty and very nutritious. It is very low in calories and fat, but high in omega-3's, fiber, Vitamin A, Vitamin C, some B complex vitamins, and anti-oxidants. Eat your weeds! applestar wrote: If it's the yellow flowered one, I think it's black medic? After looking at a lot of pics, I think you are correct. I think it's black medic as well. Check the leaf texture, Rainbow. They're ribbed (I know not the fancy schmancy term) like clover. 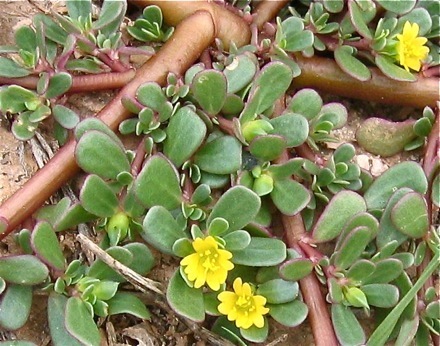 It would be easy to tell the 2 apart, purslane has thick juicy leaves, black medic has thin leaves. Deer love them both.